A delightful NAS Scotch that celebrates the PX. The Glenrothes Whisky Maker's Cut is a creation of Master Distiller Gordon Motion, aged in the finest first-fill Sherry casks, and one of the Malts from the exciting Soleo Collection. Mr. Motion says 48.8% is a bit higher, yet complimentary strength and a perfect choice for any lover of Whiskies that spent some time with Sherry. The screaming red color on the bottle reflects the color of the Pedro Ximénez grape just before it begins to ripen. It's the only “No Age Statement” release within the collection and it's bottled at natural cask strength and color. 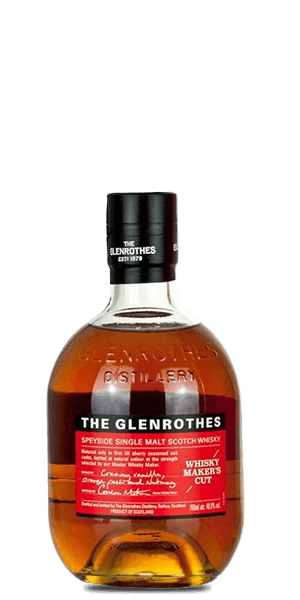 What does The Glenrothes Whisky Maker's Cut taste like? The Flavour Spiral™ shows the most common flavours that you'll taste in The Glenrothes Whisky Maker's Cut and gives you a chance to have a taste of it before actually tasting it. Resinous aromas with hints of candied peel and fresh oak. Rich and spicy on the palate with flavors of creamy vanilla and orange peel. Beautiful and long fruity finish with notes of nutmeg. It’s amazing the difference a small splash of water makes to this whisky. It changes the flavor immensely.